Lower the top over the upper rails; it should fit snugly around the outside of the frame. Holding the top so that the top edges of the support blocks and upper rails are flush, fasten the rails together (above). 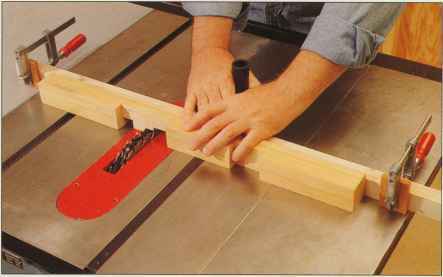 Glue and fasten the top slats in place, as shown on page 128. Use the support blocks and the top of the frame to support the slats in place of the long cleats used in the bottom of the frame. Install the upper slats as you did the lower ones, nailing them to the upper rails and support blocks.